From Sia to Elton John, Dusty Springfield to Little Richard, LGBT voices have changed the course of modern music. But in a world before they gained understanding and a place in the mainstream, how did the queer musicians of yesteryear fight to build foundations for those who would come after them? Pulling back the curtain on the colourful legacy that has shaped all of our musical and cultural landscape, music aficionado and writer Darryl W. Bullock reveals the inspiring and often heart breaking stories of internationally renowned stars, as well as numerous lesser-known names that have driven the revolution from all corners of the globe: those whose personal stories against the threat of persecution during decades of political and historical turmoil - including two world wars, Stonewall and the AIDS crisis - has led to some of the most significant and soul searching music of the last century. Bullock chronicles these struggles through new interviews and archival reports, dating from the birth of jazz in the red-light district of New Orleans, through the rock `n' roll years, Swinging Sixties and all-singing and all dancing disco days of the `70s, right up to modern pop, electronica and reggae. 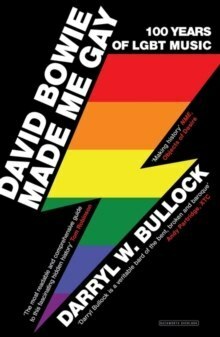 A treasure-trove of untold histories, David Bowie Made Me Gay is a moving and provocative story of the right to be heard and the need to keep the fight for equality in the spotlight.